Applying small bedroom decorating ideas to your home before placing it on the real estate market can help it sell faster and for more money. It’s to your financial advantage to make each room look as spacious as possible. As a former Realtor, I know that home buyers are really turned off by small bedrooms. I have seen many people scratch a home off their prospective list simply because of the bedroom sizes. What these buyers fail to realize is that many of the bedrooms only APPEAR to be smaller than they actually are. Too much clutter, furniture, or dark oppressive colors on the walls or draperies can make even an average-sized bedroom feel cramped and closed in. Many prospective buyers just aren’t able to see the potential hiding under all the clutter. You can visually increase the size of any small space by decluttering and applying some diy home staging secrets to your home design. Color is the key to all successful decorating— it can work magic by visually expanding or shrinking space, raising and lowering ceilings, and even effect our dispositions. Knowing some basic color theory rules will help you make good choices with your small bedroom decorating ideas. Most people respond positively to light neutral colors. Your goal is to make your home appeal to the largest number of buyers possible. Paint is a cheap and quick way to give any space an immediate facelift. Proper color combinations can deceive the eye into thinking that a small bedroom is larger than it really is, or take an awkward-shaped room with weird angles and badly-placed windows bedroom and minimize these graceless areas. 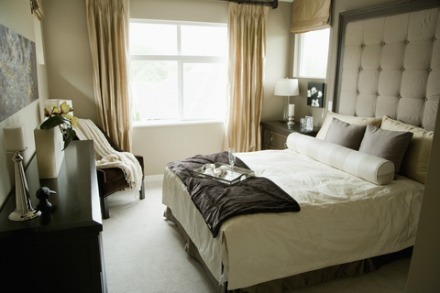 Pale colors reflect light, and can visually expand a small bedroom by giving the impression of pushing back the walls. Dark colors absorb and deflect light and give the impression of walls closing in on you. A successful room will have a combination of cool and warm colors in the design palette, but one or the other should dominate. Look around your small bedroom to identify the room's good and bad qualities. Which features do you want to highlight and which parts do you wish to hide? Minimize the length of a long, narrow room by painting the long walls a light color and the end walls a darker warm shade of the same color. Because darker colors advance, this gives the effect of "shortening" the room. Another tip for a long narrow room is to apply a bold wallpaper on the end walls in a darker color than the long walls. When home staging, keep the wallpaper neutral, something that will appeal to most people. Paint colors that work well in a small bedroom are whites, neutrals, pale grays, blues, lavenders, and greens. Men and women both like blues and grays in this space. A small bedroom will appear larger by painting the walls and trim in the same color. This also makes ugly molding appear to blend into the walls, making them less noticeable. Avoid overly bright or dark colors. If bedroom walls are covered in outdated wallpaper, take it down, as practically most home buyers will hate it. As a rule, wallpaper should be avoided when staging your home for sale, unless it's very neutral. It’s just too taste specific and most home buyers don’t want to deal with it. Introducing too many different colors can overwhelm a small room. A color palette of lights and neutrals will visually expand any small space. The most successful color combinations for a small bedroom are monochromatic color schemes. This room design style uses only one color in varying shades, tints, tones, and textures in the wall paint, draperies, furniture, and flooring. A monochromatic color scheme will successfully create the illusion of a more expansive and calming space. To create a monochromatic room design, paint the walls and molding in different shades of the same color, such as white, off-white, grey, or beige. Do the same with the furniture, draperies, bedding, pillows, throws, and an area rug. A monochromatic color scheme is usually accented with crisp whites in the trim work, lamp shades, and accessories. Many people may yawn at the idea of a room design that uses only one color, but by incorporating variations in tones and textures, accessorizing with glass, metals, and objects from nature, you can create a feeling of relaxation, spaciousness, and sophistication in your small room design. When selecting paint for a small room, stay away from a glossy paint finish. Because of its reflective quality, a glossy paint finish will highlight every flaw in a wall, and won’t appear to recede as well as a flatter paint finish will. A flat paint has a matte finish that doesn’t reflect light, causing it to hide flaws better—the downside is that it’s not scrubbable and looks chalky. The best paint option for most walls is an eggshell or satin paint finish, with a light luster and scrubbable quality. A flat paint is typically used for ceilings; a semi-gloss or glossy paint finish for trimwork. Don’t be afraid to incorporate texture into a small bedroom. In the absence of wild patterns and bright paint colors, texture adds excitement and interest to a small room. Vary the textures of things you can touch (tactile) and things you look at (visual). Shiny, satiny fabrics on a bedcover, window treatments, or accent pillows will help illuminate a small space. Mix in nubby fabrics and faux fur throws to make your small bedroom more interesting. Avoid heavy brocaded fabrics in dark colors in small room design. 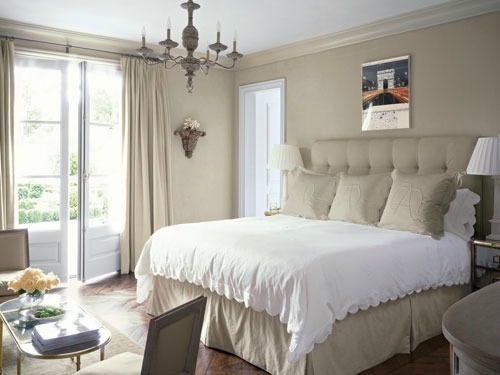 Dress the bed in soft colors and lustrous fabrics to impart a feeling of luxury. Soft blues, greens, grays, whites, and creams are restful, sophisticated colors. See staging the bedroom. Use solid neutral colored bedding to stage a small bedroom. Solid colors create that high-end look home buyers are looking for. See interior colors for home staging. Painting wide horizontal stripes on the walls can visually widen a small bedroom. When home staging, use subtle or neutral colors for striping. Keep patterns to a minimum in a small space. Use fabrics with texture rather than pattern on larger pieces, such as an upholstered chair, so as not to overwhelm a small space. Lighting fixtures can have texture as well. For instance, polished chrome will be smooth; wrought iron will add a rustic feel. Use accent pillows to add bits of color and pattern in a small bedroom, but don’t go overboard. Three pillows is sufficient. Arrange pillows and accessories in odd numbers as this creates a more relaxed feeling. See art of accessorizing. Lighting is a key element in making small rooms look more spacious. Bedroom lighting should be relaxing and from several different sources. 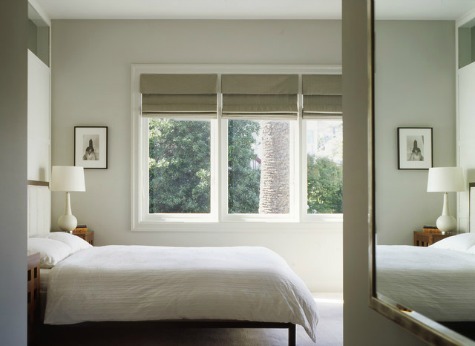 Open the drapes or curtains to allow as much natural light as possible to flow into the bedroom. Natural light will transform a small space. One glaring overhead light fixture can dominate a bedroom, drawing the eye to that one spot. Apply more than one source of light in a small space to keep the eye from fixating. If there's no room for bedside tables, mount lighting fixtures on the wall on each side of the bed, or one fixture over the middle of the bed. The most practical task lighting fixtures for reading in bed are swing-arm wall lights. 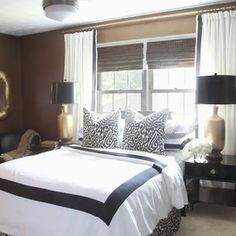 Another option is to hang pendent lights from the ceiling on each side of the bed. Be sure to hang them low enough that you can turn them off while lying in bed. Recessed lighting is the answer for low ceilings and small bedrooms, because they are, well…recessed into the ceiling. They don't take up space by protruding down into the room. Torchiere lighting (floor lamps with light shining up instead of down) will bounce light off the ceiling and back down into the room. Typically, you should have another torchiere light in the room to balance the light. If the ceilings are in bad shape, don’t use this type of lighting, as every ceiling flaw will be emphasized. Dark unlit corners of a bedroom make a room feel smaller. See interior lighting. A vertical pattern or stripes on the focal wall, can visually "raise" a low ceiling. Avoid wallpapering each wall in a tiny bedroom, as the effect can visually shrink the room. Another home staging tip to "raise" the ceiling, is to mount window treatments higher than usual. Hanging draperies from the ceiling to the floor creates a strong vertical line. A dark wall against a white ceiling can make a small bedroom feel too enclosed. By uniting the walls and ceiling with the same light color, it's harder for your eye to tell where the walls and ceiling meet, so the room feels larger. Continue light tones onto the floor with light-colored hardwood floor, or a neutral-toned carpet. Make a low ceiling appear higher by painting it a light receding (cool) color. A ceiling that is too high can be visually lowered by painting it a darker color than the walls. Bring the color down a foot or so onto the wall for greater effect. The more flooring that is exposed, the bigger a small space will seem. A light-colored hardwood floor or a light-colored carpet will make a small bedroom appear brighter and more open. A striped floor will make your room appear longer than it is. If you are trying to sell your home, I don’t recommend painting your wood flooring with stripes unless they’re very subtle, because it’s too “taste specific.” Instead, use a large area rug with wide stripes to visually lengthen the floor. TASTE SPECIFIC: Your specific taste may not appeal to a very large number of people. When selling your home, your goal is to target the most buyers possible. Home staging helps you achieve this. Small bedroom decorating ideas include placing a large area rug under the bed. Make sure that the rug extends past the edge of the bed at least 12- 18 inches. Or place two identical rugs, evenly spaced on each side of the bed. This will draw the eye outward and will seemingly stretch the room horizontally. Extend the visual length more by using area rugs with stripes to fool the eye. For area rugs that fill most of a room, you should typically have about 18 inches of exposed flooring showing between the rug and the walls. For a small bedroom, reduce this number to about eight inches. Avoid scattering too many small rugs in a bedroom— this will only look cluttered. If your small bedroom walls are broken up with doorways, poorly placed windows, nooks, or slanting ceilings, make them less conspicuous by painting them the same color as the walls. Electrical outlets and switch plates are also a distraction to the eye if they contrast with the wall color. If possible, match them closely to the wall color. Make an ugly brick fireplace less noticeable by painting it the same color as the walls. Doing so will make the fireplace less obtrusive by blending in. See painting interior brick. If you plan on doing some remodeling before selling your home, small bedroom decorating ideas include stealing some space from an adjoining room’s closet to expand a small bedroom. Removing a wall between two small adjoining bedrooms to create one large bedroom is another option. This can be a risky proposition though, as you will be downsizing the number of bedrooms in your home, possibly decreasing the value of your home. 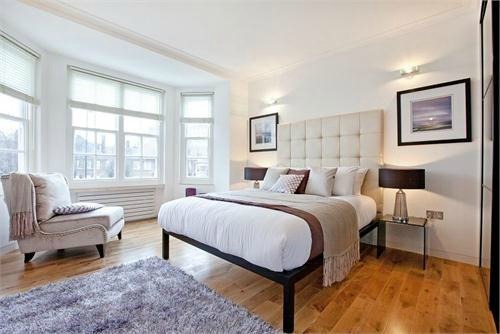 If the only place for the bed is right in front of a window, stage the window as a focal point. Every good room design begins with locating the focal point first, then planning your interior decorating around it. If your small bedroom is devoid of any outstanding features or focal points, the bed naturally becomes a focal point merely because of its size. You may have no choice when placing the bed in a small space because of the confines of the room. If you do, interior designers recommend that you place the bed where it looks best as you enter the room. The foot of the bed should be the first thing you see as you walk into a bedroom and should be placed furthest from the door. This is usually in the middle of the longest wall. Downsizing the bed is one of the best small bedroom decorating ideas ever! In the master bedroom, replace a king size bed with a queen. 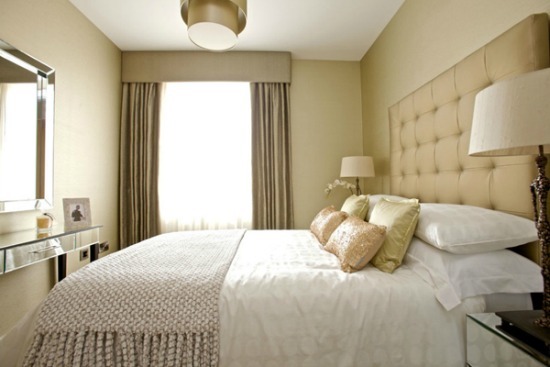 In smaller bedrooms, replace a queen or double bed with a twin. Downsizing the bed will instantly make a small bedroom look bigger by introducing “breathing room” on each side of the bed. Often, you are left with no other option than positioning the long side of the bed against the wall, leaving you room for only one nightstand...maybe. This is perfectly acceptable. Use a daybed in place of a regular bed and stage the room as a pretty sitting area. Don’t automatically place your bed against the wall. Sometimes positioning the bed at an angle will make a room look bigger. Placing the bed on the diagonal, which is the longest line of a room, will feel more spacious. If your bedroom is really tight for space, this position won't work, though. Some interior designers say that the eye travels more quickly through a small space. Keep the eye moving longer by eliminating anything that stops the flow of the eye, like clutter, contrasts in color, and dark heavy draperies. Use fewer pieces of furniture, instead of a lot of small pieces that can make a room feel more crowded. The farther the eye can see into a room without stopping, the better. Scale is important to consider when choosing furniture for a small bedroom. Avoid overly large bedroom furniture, like sleigh or canopy style bed frames. They have a heavy presence and will swallow up a small space. Remove the footboard from your bed frame to reveal more visual space. Use armless furniture to create more visual and physical space. Don’t be afraid to have one or two large pieces of furniture in your small bedroom. Using one bold piece of furniture, like an upholstered armchair or armoire, will actually make a small space look less cluttered then many smaller pieces. When you are staging your home for sale and need a cheap bed, stack up air mattresses on top of a platform or bed risers. Once you make them up with lovely bedding, no one will ever know! Don't place mattresses on the floor. Doing so will give a bedroom that tacky “college dorm” feeling. When choosing upholstered furniture, select light-colored fabrics similar to the wall colors. This will have a unifying effect. Select furniture with “open designs”, like a metal bed frame, and a nightstand or armchair that are raised on legs to create a sense of light and space. One of the best small bedroom decorating ideas is to use furniture with glass see-through tops, or clear lucite pieces that give the impression of more space by extending sight lines. Mirrored furniture will reflect the many surfaces of a room, appearing to open up space. Take advantage of the vertical space in a small bedroom by using tall pieces of furniture instead of lower wide ones. You get the same amount of function, but gain floor space. Avoid using an entire suite of matching dark furniture in a small bedroom. Bedroom furniture suites are outdated and always seem to "shrink" a room. Instead, use a mix of light and dark pieces for a fresh look. Storage issues can be solved with the purchase of a lift storage bed or a bed frame with built-in drawers. Lift storage beds operate on a pivot frame and offer a large space under the mattress for stashing things. Go to overstock.com to find lift storage beds or bed frames with drawers. For extremely small bedrooms, remove all the furniture except for the bed and nightstand. Add shallow built-in shelving for extra storage. Shelves won’t eat up precious floor space, especially if you recess the bed in the middle of shelving units. Shelves that go all the way to the ceiling will give the effect of “raising” the ceiling by creating a long vertical line. You’ll gain extra storage as well. Rather then having nightstands on each side of the bed, put up floating shelves instead. They won’t take up any floor space which will give you a more open feeling by providing extra floor space. Small bedroom decorating ideas include taking advantage of multifunctional furniture. Use a short dresser with drawers that can double as a nightstand. A pretty vintage steamer trunk or ottoman with a lift-top can serve as seating and storage for blankets and linens. Remove the television, electronics and exercise equipment from the bedroom. They just add to the clutter and don’t create a restful ambience. If you have a great view, leave windows bare of window treatments to fool the eye into thinking the room has more depth. If you need privacy, hang sheers for an airy feeling. Create the illusion of taller windows and ceiling by hanging curtains higher than the window frame. Create the illusion of wider windows by extending the curtain rods well beyond the width of the window, wide enough so that curtain panels don't cover any glass when fully opened. Avoid hanging dark heavy window treatments which can have a confining effect. Sheers or light colored panels will reflect the natural light in the room. Using drapes that are the same color as your walls will make the bedroom look bigger. If your small bedroom windows don’t offer adequate natural light, consider installing a skylight. This is the last phase in home staging a small bedroom— the fun part! When your furniture is arranged exactly to your liking, accessorize with bedding, window treatments, accent pillows, and artwork. This is where you can apply some color if you want to. When accessorizing in a small space, keep room decorations to a minimum. Limit collectibles to one or two favorite pieces, or allow one outstanding accessory to become a focal point. Avoid displaying lots of small objects, which can look cluttered. Mirrors are one of the best small bedroom decorating ideas! Mirrors are a favorite tool of interior designers for visually expanding space and bouncing light around a room. If you have a great view, try to place a mirror where it will reflect that view. 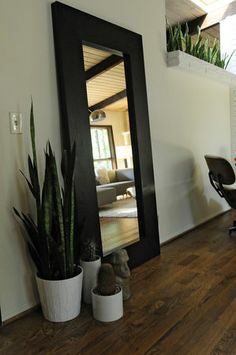 Or, hang a mirror where it will reflect a light source or focal point, like a fireplace. See leaning pictures and mirrors for more home design ideas. Another home staging tip is to lean an oversized floor mirror against a wall, or hang multiple ones together to create a feature wall. Wall-to-wall mirrors, like the ones on sliding closet doors are great at creating a feeling of spaciousness in a small bedroom. But, I have never yet met a home buyer that likes them! If you are trying to sell your home, you take a risk by installing them. Small bedroom decorating ideas include depersonalizing; reducing daily clutter, like makeup, prescription pills, etc., by stashing them inside attractive boxes and baskets. Instead of an enormous arrangement of flowers, display a single elegant bloom, like an orchid, or peony. Use accessories with reflective or see-through qualities that will blend into the background. Hang a landscape picture! Landscapes have perspective which will draw the eye in, sort of like looking out a window. The most important place to hang a painting is opposite the bed. Don't be afraid of using one large piece of art in a small room as a focal point. Arrange floating shelves with plenty of space around objects. Avoid hanging large pieces of art with heavy ornamental frames. Large artwork is fine, just make sure picture frames aren’t bulky. A large frameless painting with canvas wrapped edges is ideal. Group smaller pieces of artwork together, so they read as “one” piece, or a unit. Not too many pieces, though, as they will look like clutter. If your small bedroom has built in shelving, don’t cram them completely full. Allow breathing space between objects to give the room an open look. 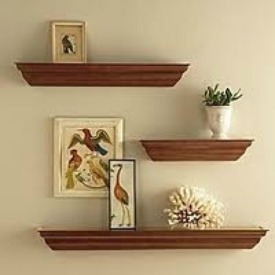 Hang floating shelves instead of shelving with ugly bracketing or heavy corbels. Floating shelves take up less visual space. For more small bedroom decorating ideas to make bedrooms appear larger and correcting small space mistakes, watch the video below by Libby Landon.